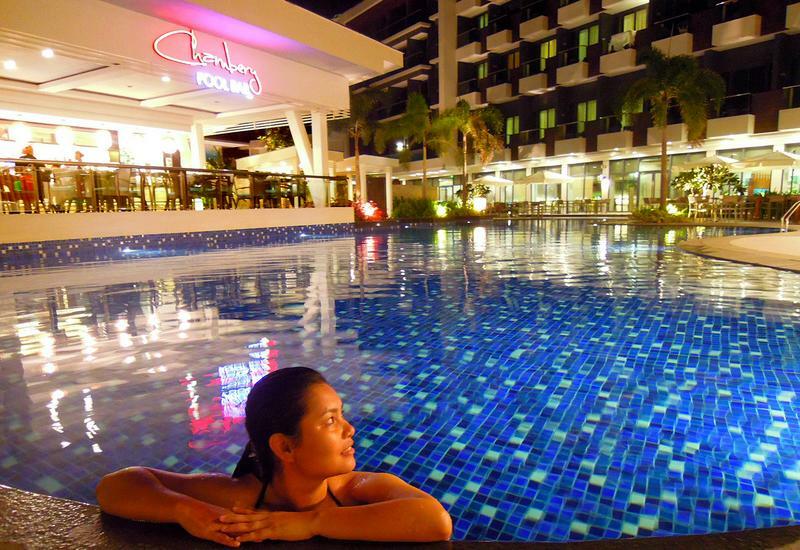 I was already planning on booking a hotel somewhere in Quezon City, so that I could give myself that much needed R&R. But I no longer had to, as I was recently invited to a weekend stay in two of Microtel's well-appointed hotels: Microtel-UP Technohub and Microtel Acropolis. I fell in love with Microtel the first time I stayed with them in General Santos. The staff were always courteous and all smiles; and the hotel's interior decor always complemented the overall look of the property. It wasn't long until I booked one of their properties again (South Forbes). So you can imagine my excitement when I was invited to try two more Microtel properties during their recent City Media Familiarization Tour. The first hotel in our itinerary was Microtel by Wyndham - UP Technohub in Diliman, the first hotel in the Commonwealth area. Microtel by Wyndham UP Technohub has 120 guest rooms, all of which have chiropractor-approved mattresses. The six-story building, which faces Commonwealth Avenue, is located within the premises of UP-Ayala Land Technohub. TAKE THE PLUNGE, WHY DON'T YA! After checking in, Mr. Dandi Galvez (Microtel's Marketing Communications Manager) accompanied me up on the roof. I've always been a sucker for beautiful perspectives, so my jaw literally dropped when I finally saw the gorgeous 4-feet deep roof deck pool. The rooftop itself had a very simplistic yet modern design to it. Even the borders of the pool were made of wood planks to make it look more current. The roof deck looked different when the sky changed from an orange shade to a blue azure filled with stars. I gradually saw how the beautiful city lights surrounded the property. Microtel UP Technohub will also be offering swimming classes for kids aged 4 and up for only PHP 3,000/10 sessions. Classes will be every MWF starting this April. We were soon escorted down to Millie's All-day Dining, which is located at the lower ground floor. But before we sat down for dinner, we decided to explore the garden quadrangle to take more pictures. The quadrangle would have to be my second favorite area in the hotel, as it looked so scenic at night. It definitely exuded a cozy and romantic ambiance. Once we finished taking photos, we went back to Millie's where we were served a sumptuous and generous plate of fried chicken with salad and french fries. We also got to sample their Mango Panna Cotta, which was a tasty and creamy delight. It wasn't long until Mr. Guy Umali (Microtel UP Technohub's General Manager) and Ms. Ajie Pedalino (Microtel Assistant Director of Sales) joined us for dessert. We talked about UP-Technohub and its beginnings, and Millie's noteworthy background. The hotel's official dining facility is the latest of only three restaurants in the Philippines. The restaurant was named after Millie, the mother of Jose Mari del Rosario, President and CEO of Microtel Inns & Suites (Pilipinas) Inc. Millie loved to travel, and her personal collection of souvenirs can be seen displayed in the restaurant for diners to see. And through her travels was she able to share a good selection of cuisines that she was able to sample from the places that she's been to. We packed up a bit late, but some of us still had some energy left. So we went out to explore the vibrant UP-Ayala Land Technohub. It's just a short 5-minute walk from the hotel. So should you feel like getting some midnight snack, you can always head out and grab some grub there! Most establishments are still open until late in the evening, as the area is home to several restaurants, technology and business incubators, research firms, BPOs, and other commercial establishments. My friend and co-travel blogger, Monica slept really late. But we were still able to enjoy what our room offered us. The hot water from the rainshower definitely relaxed my tired body. But the best part was the chiropractor-approved mattress, as it gave me the most relaxing sleep. Microtel also offers other room types like the 1 Queen Bed Suite, which provides a larger and more roomy space. It also has its own kitchen and living space. Furthermore, this particular room offers a nice view of the garden quadrangle, which lights up so beautifully at night. The Microtel team also shared that their suites are usually booked by couples, particularly those who are soon to be wed. Some even do their pre-nuptial photoshoots by the garden during daytime. They also provide rooms for their handicapped guests, complete with safety hand rails in the bathroom. You'll also find Braille markings on the wall and doors, as a means to help their visually impaired clients. The hotel also paid tribute to UP by naming some of their function halls "Oblation" (famous statue and iconic symbol of the University of the Philippines) and "Kamia" (one of the many dormitories around the Diliman campus). The hotel also has 4 function rooms in total, which guests can rent without booking a room from Microtel. If you find yourself wandering in Quezon City, and you happen to be looking for a nice and cozy home for the night (or two) or a place to celebrate special occasions (i.e. wedding reception and other social gatherings), then you might want to consider staying at Microtel UP Technohub. Not only does it afford its guests a no-frills and back-to-basics kind of lodging, it's also near some of QC's main attractions such as Quezon City Memorial Circle, the University of the Philippines-Diliman, Jorge B. Vargas Museum and La Mesa Ecopark. Thank you again, Microtel-UP Technohub, especially Millie's for all of the meals that you served to us during our stay. Your delish Chicken Parmigiana was definitely my favorite! Note: This is a sponsored stay with Microtel UP Technohub. (Budget Biyahera) I do not represent the thoughts, intentions, plans or strategies of the establishment or its owners. All views and opinions shared on this website are solely my own.